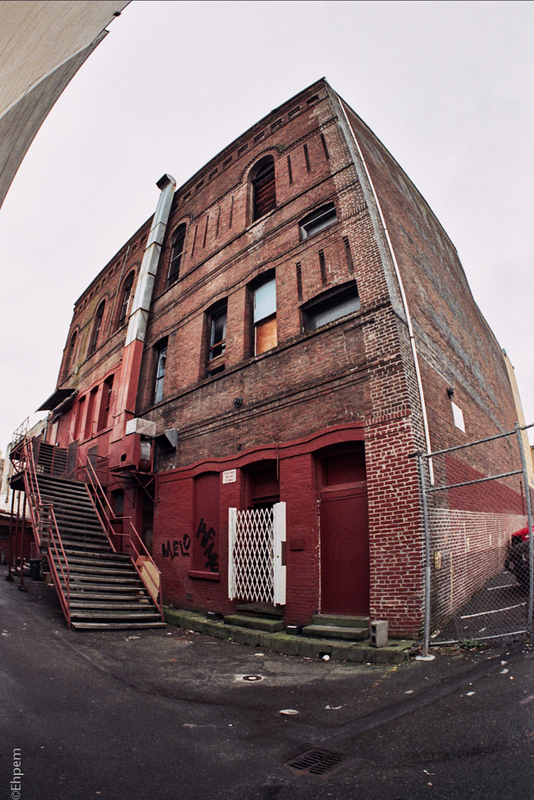 Another photograph around back in an a Victoria alley with a fisheye. Interesting approach to partially repointing the mortar on this building. The whole building looks like it needs the same tlc. The Fish-eye lens has turned a fairly ordinary building into something special. Two particular points are the way the top left corner has been filled in by an adjacent building; and (more importantly) the curved corner of the building down which a down pipe appears to run. You mentioned the re-pointing – the strange thing, (which is also a compositional bonus), is that the re-pointing is confined to a thin vertical section of wall at the corner further accentuating that curving line. A very effective composition. Thanks for you comment Andy – I am finally back home and somewhat deadline free. I very much appreciate your analysis – it is so nice to hear such from an accomplished and thoughtful photographer like you. That line of pointing did not really register when I took the photo, but the corner of the building did and I expect the emphasis from the pointing was one of the reasons. I like the older brick better, but it sure is puzzling this way, and fun to look at through the fisheye. I like the older too, but all buildings need repointing from time to time. Around here there is very little sophistication in bricklaying and so you get this awful white mortar applied in these circumstances. When I worked in the UK there were people that were experts in mortar who went to great lengths to mix the perfect matching colours when doing maintenance and restoration work. A real art form, with ingredients from all kinds of quarries and locations, based on information passed down for generations. One place I worked was St. James’s Palace which had some restoration work being done. The mason doing the work was getting on, probably in his 70s and an absolute genius. He showed us some of his craft, how he mixed to get the right colours for the 17th century brick/mortar vs the older Tudor parts. I wish I could have spent a lot more time with him, rather than underground digging out one of Henry VIII’s barrel vaulted septic tanks. I love that and can easily picture that mason – but no, you can’t expect that kind of care for a “normal” building. And Andy has a great critique above, I agree, a very effective composition!